If someone asked me what I would choose as the one single dish to have as my last meal on earth, I would have a hard time coming up with an answer. However, I am sure Frijoles Antioqueños would be near the top of the list. 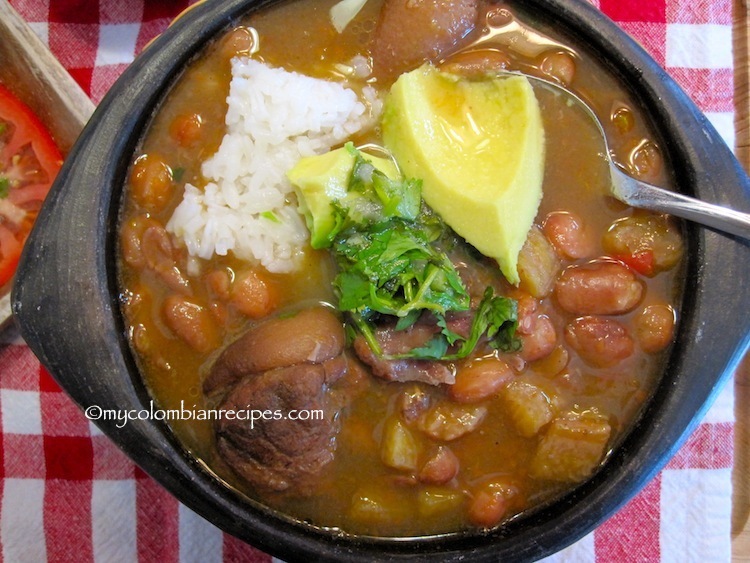 The recipe today is a gorgeous, hearty Colombian bean soup from my hometown of Antioquia, and is known as Frisoles. 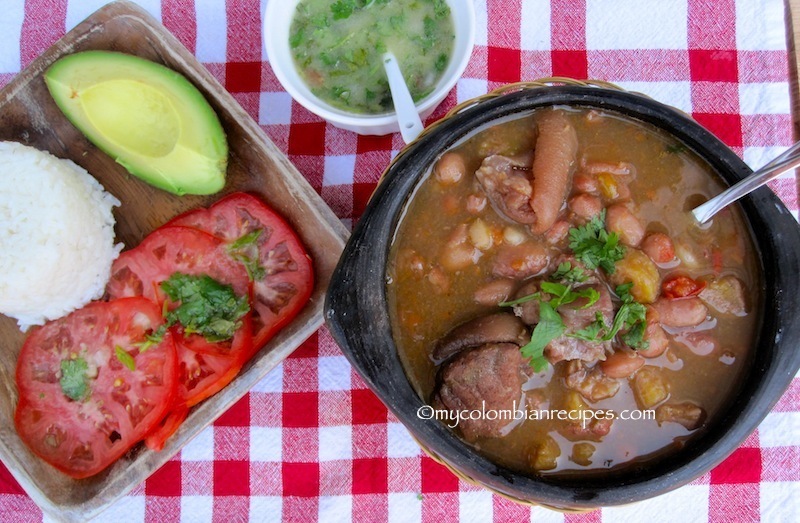 A mix of delicious beans, green plantains, aliños, carrots, hogao and pork hocks. It’s a perfect fit with the current weather here in the Northeast, somewhere between late summer and fall. Traditionally this dish is made with cranberry beans, but you can try pinto beans as well, just stay away from canned beans! 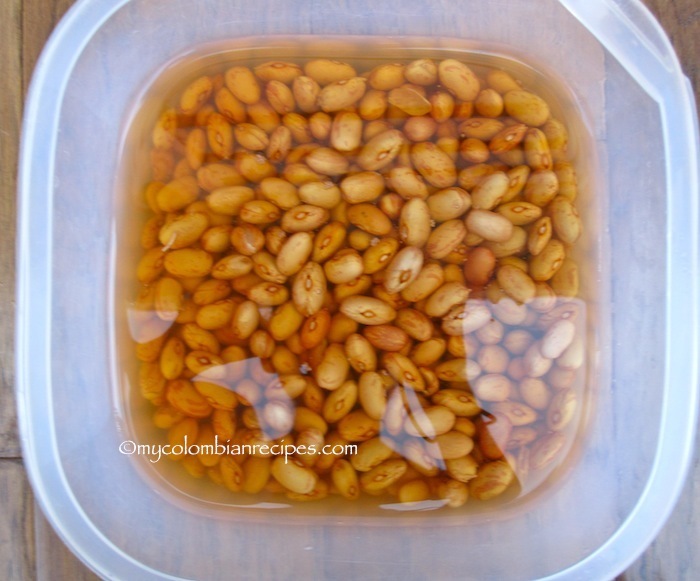 This is a recipe where dried beans play a huge role. 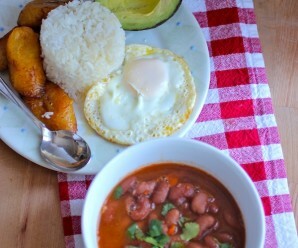 Frisoles is also the perfect dish for a cool, rainy day, served with a steaming bowl of white rice and avocado. 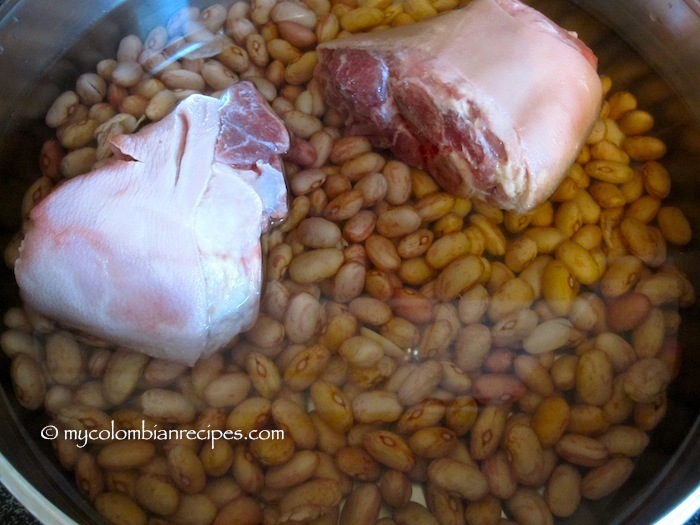 Drain the beans and place in a large pot with the pork hocks and water. 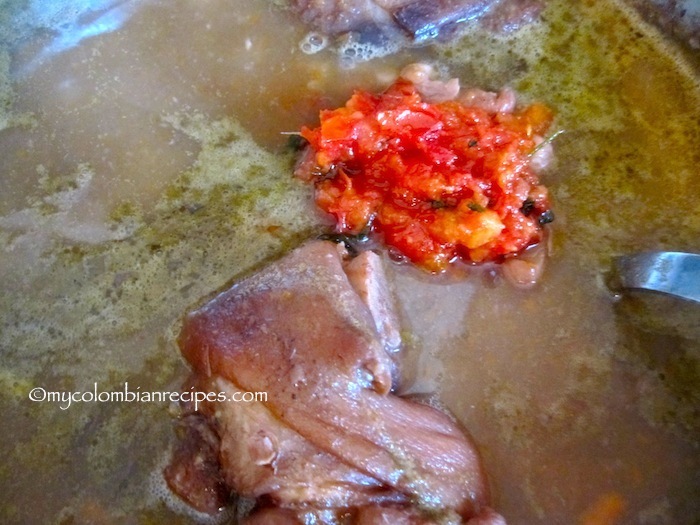 Place over medium-high heat, bring to a boil, reduce the heat to low and simmer, uncovered, cook for about 20 minutes. 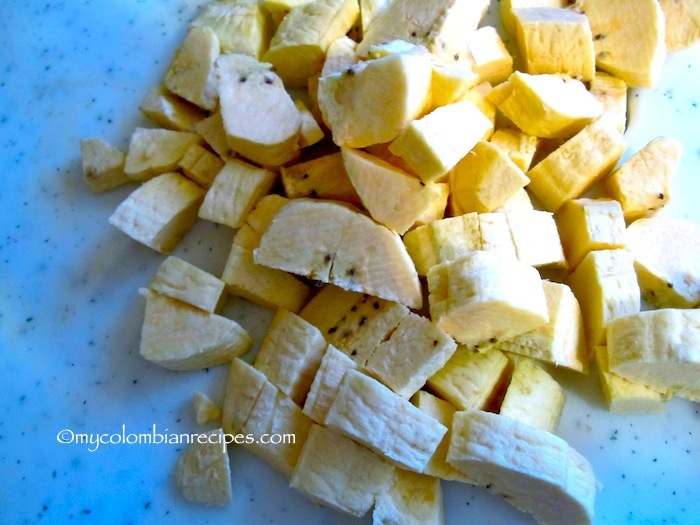 Add the diced plantain, carrots, aliños and cumin. Cook for about 1 hour. Add the hogao , chopped cilantro and season with salt and pepper. Cook for 15 minutes more or until the beans are tender. 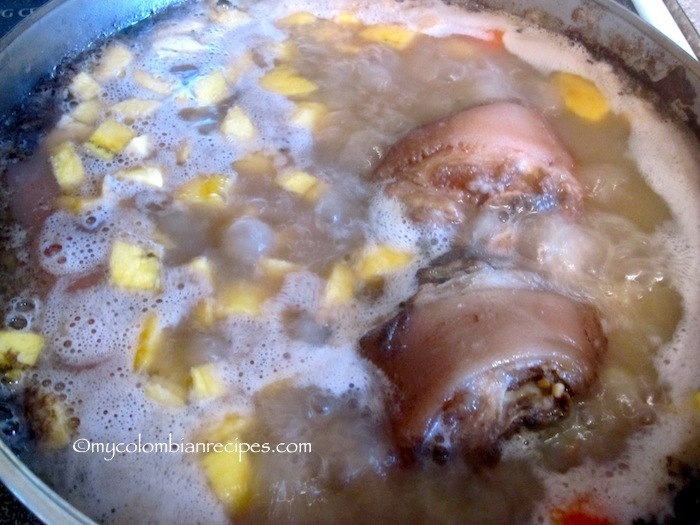 emove the ham hocks from the soup and set aside until cool enough to handle. Discard the skin and bones and cut the meat into 1/2-inch pieces and set aside. Remove the carrots from the soup and place in a blender with about 1 cup of the soup. Blend until smooth and return to the bean soup. 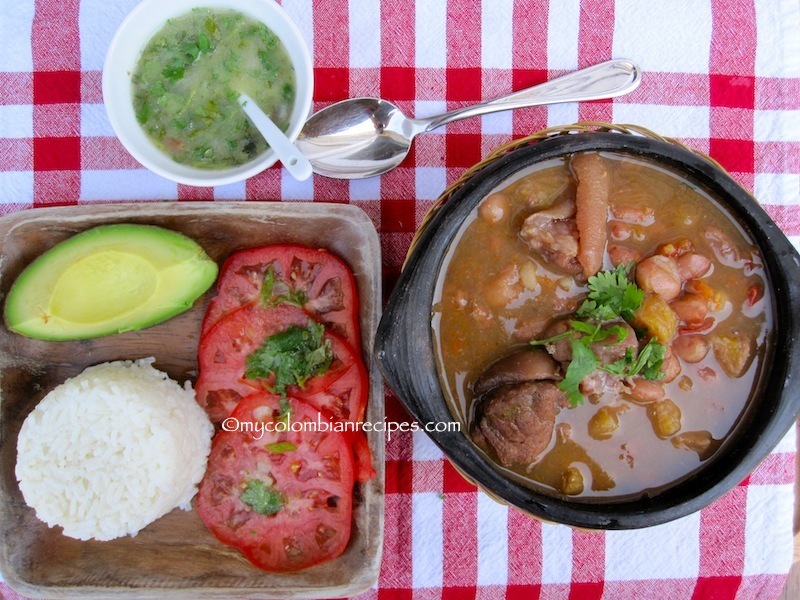 Ladle the soup into bowls, Add pieces of pork hocks and serve immediately with white rice, ají and avocado. That pork must add the best flavors – your last meal, eh? This MUST be good! I don’t know….I will check that recipe! This bean dish looks fantastic! 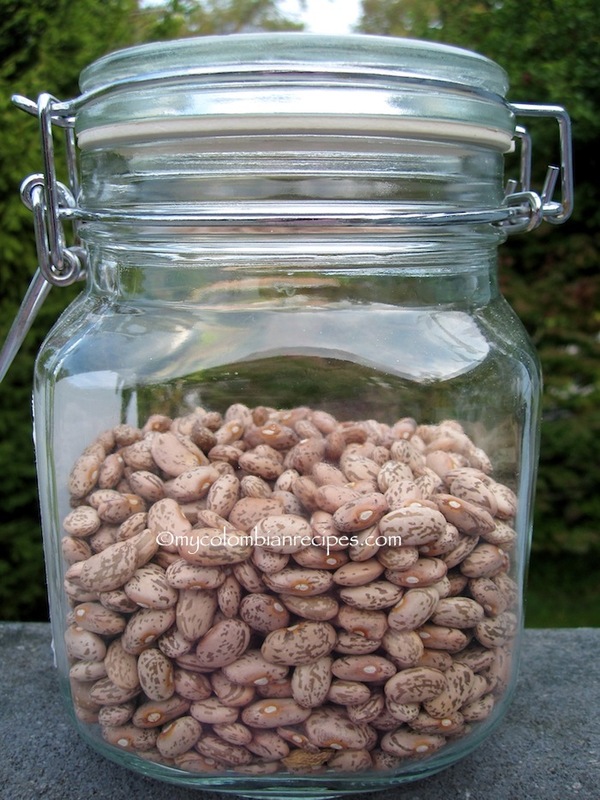 I need to the make it next time i ‘ve got some beans and maybe substitute if I dont find the pork hocks around here. Que felicidad encontrar esta pagina, Yo llevo viviendo 4 anos en USA por que mi esposo es de aqui, y la verdad nunca aprendi a cocinar en Colombia asi que he sobrevivido apunta de hotdogs, cheeseburgers, y steak. (estoy exagerando). Finalmente y sin saber queme muchos arroces y sale pollos, ahume agua etc.. pero aprendi a cocinar pollo con arroz en todaas sus variedades.. pero my muy esposo americano se aburrio del pollo con arroz y arroz con pollo. Voy a usar muchas de estas recetas! Gracias Gracias!! Lo que mas me gusta es que utilizas los ingredientes que uno podria encontrar aqui. Hola Maria, Gracias por tu comentario y bienvenida al blog! I made this on Sunday for my Colombian husband and it was perfect. Thank you all for visiting my blog and your comments and feedback! me encanta esta pagina!! gracias erica por sus recetas! So, I told my husband… brace yourself! you will never want to eat another hamburger again.. Erica please don’t ever erase your page, I’m planning my weekly meals from this page. Seriously. 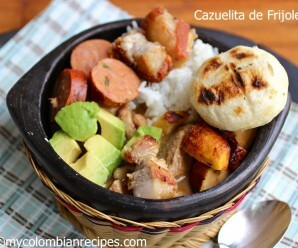 Colombian Food.This site has the best Traditional and Modern Colombian Recipes. This bean soup looks so flavorful. I definitely want to try it. 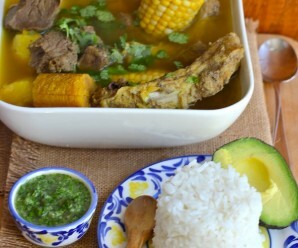 Especially like how you put rice and avocado into the soup at the end. That is a meal! Es necesario usar olla presion para cocinar los frijoles? Yo no uso la olla presion. No, en Colombia solo los ricos tienen olla a presion. En el campo se hace desde el medio dia y se cocina hasta por la tarde. Lo que sobra se come al desayuno con Arepa y se le llama “re-calentao”. (la version Antioquena de “Refried Beens”). Tambien tomese su tiempo y disfrute la preparacion. Los aromas y prepare los ingredientes a mano, cortando con cuchillo y no en la maquina procesadora. Esto le dara otra textura al plato y los aromas y sabores son extraidos lentamente, combinandose a su tiempo y no prematuramente como en la maquina procesadora. I found your site a month ago and I was so excited. I made this recipe today and I can’t wait to eat more. This is delicious and very tasty. :). Great recipes. I would not recommend brand names to keep it 100% authentic. In addition, Sason Goya has MSG. Not healthy. Don’t get me wrong, I love Goya, just not MSG. Great site…..
Im so glad to have found your wonderful blog! I’m from Sweden and my boyfriend is from Bogota, Colombia and we both really miss the colombian cuisine! 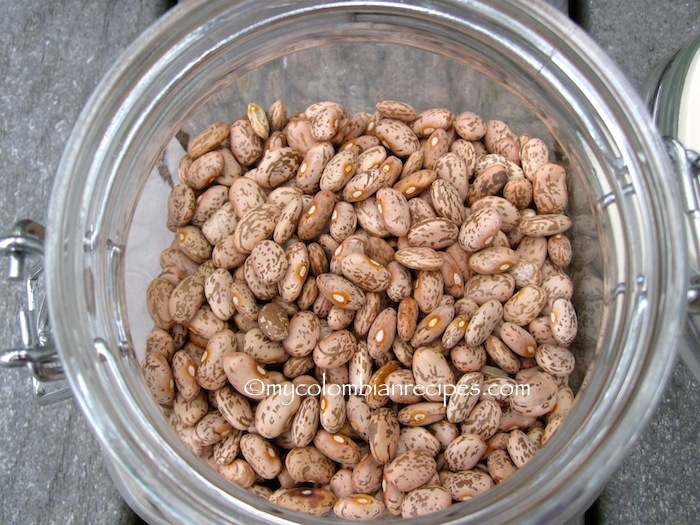 (we live in Sweden) I have been trying to find a good recipe for frijoles a long time now, since its one of my favourite dishes, so i was superglad to find this. Thank you! This looks so delicious!!! It is soul food. OMG. I’m from Bogota, but I still love these. I hated them as a kid (I admit) but now that I’m far away I CRAVE them! My mom actually makes thesse with some bacon added. Damn it so good. Love it, I will try to make them! Que rico encontrar esta pagina! 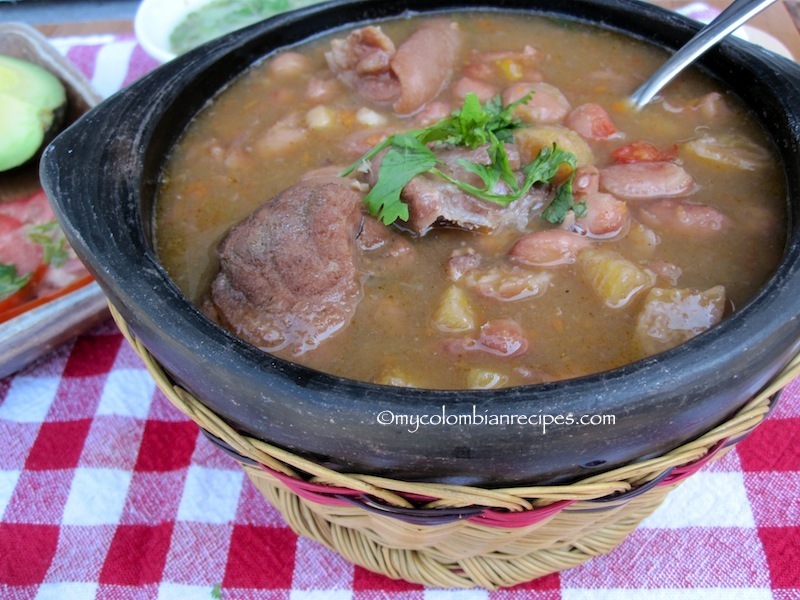 Gracias por tus recetas a ver si al fin le gusto los frijoles a mi esposo!!! Thanks for the recipe. 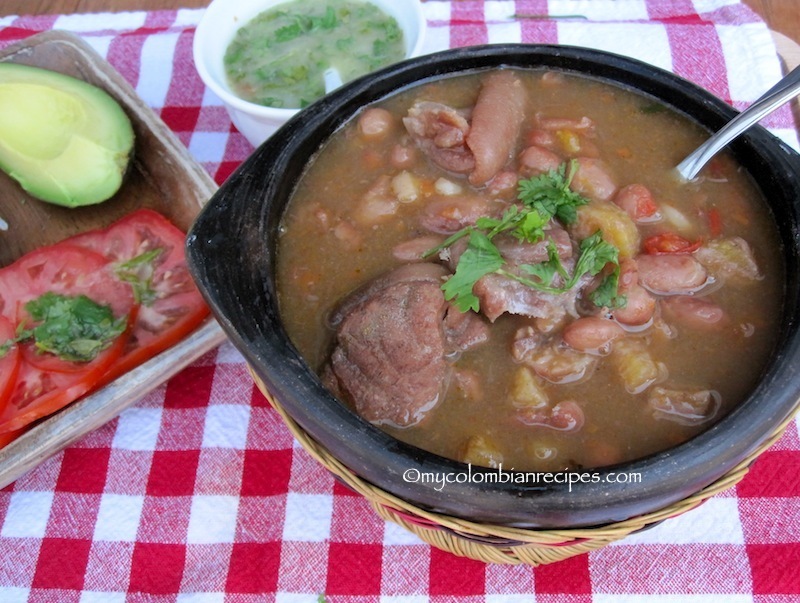 Is the pork a must for the frijoles recipe? Sabor de mi tierra. Eh ave maría home. Que verraquera. My husband and I just returned from a month-long trip throughout Colombia. We’ve been craving this bean soup, since we left. This recipe is fairly simple, and delicious! Hi Erica! Thank you so much for sharing your wonderful recipes! I have been having so much fun trying them out, and I have fallen in love with your frijoles antioquenos! Mmm Mmm! I feel like I’ve been transported to Colombia. I can certainly see why you say those would be high on the list if you had to choose your last meal. I actually have a gluten intolerance, so I am looking forward to trying your pandebono recipe! Thank you for your wonderful recipes ! 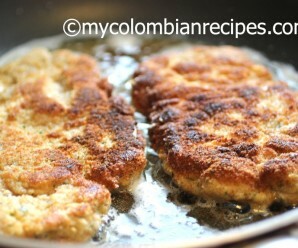 I want to cook this for friends who come from Medellin but I have a doubt : should the pork hocks be salted/cured/smoked or plain/raw ? Thanks for your answer ! I already tried your recipe in a vegeterian version just to have an idea what it tasted like… It’s heavenly ! 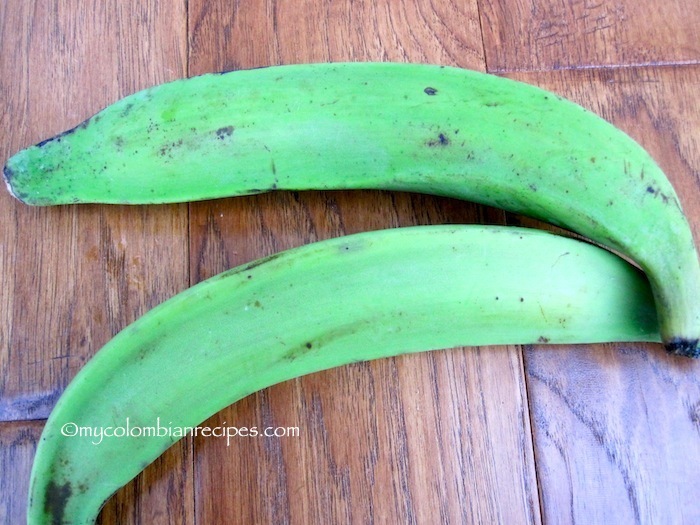 This blog is a really inspiration to try out and share traditional Colombian food. I will be making this on the weekend and planning to invite all my mates over to try out the food I grew up with. Thank you for all your amazing recipes. I made the beans, and I used a pressure cooker. They turned out great and the flavours were amazing. I had a couple of questions. 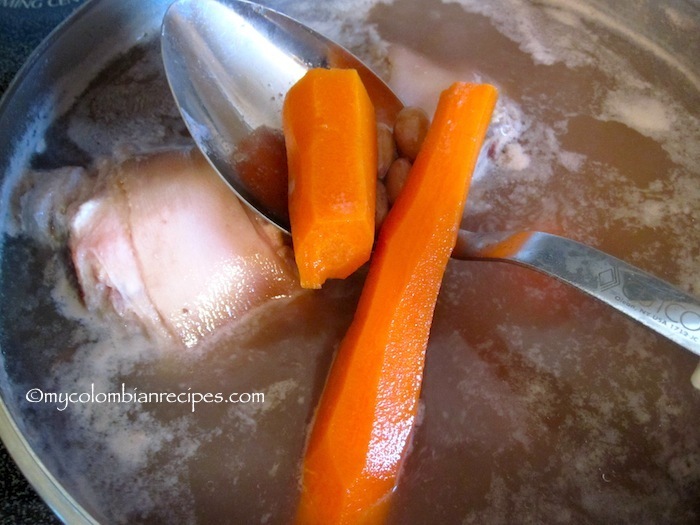 In Colombia I remember the beans that I ate were in a thicker broth. What controls how thick the broth is, and how thick is your broth supposed to be? Also, when you buy your pork hocks, do they come in the 1/2 to 1lbs sizes? I ordered a pork hock from the butcher, but it was a 2.5lbs piece. When I got home, I realized that it was too big, but I could not cut it much smaller. Hi Eric, it seems you did not get a reply to your question on the thickness of the broth, which was a question I had when I first started cooking beans on my own. I also use a pressure cooker to cut down on cooking time, but the beans def need some slow simmering to develop flavor and reduce to a rich consistency. I cook in the pressure cooker for about 15 mins to soften , then proceed with the recipe (same pot, without pressure), including the step where you blend the carrot with some of the beans and broth. I mash mine, LOL, skip the blender. Then just simmer till they are to your liking. I like a thick, rich broth, but not porridge. BTW, I often make them completely vegetarian, ie no ham hock or animal product of any kind, so everyone in my family can enjoy. They are still quite delicious!